I am always so excited to share my stories with you so I hope you don’t mind. My daughter and I went to visit Evan’s brother and sister-in-law this past week. A much needed trip for both of us. It has been a long time since we have been anywhere. Saturday on our way back to where we live, we went to visit Evan at Montgomery Federal Prison Camp. It was an emotional visit and it was so good for all of us to see each other and be together for a while. Two major things happened. I wore capri leggings (very tasteful, I dress conservatively), and a long conservative shirt over it that went down to the middle of my thighs. I had been driving for 5 hours to get there so I didn’t want to wear jeans. 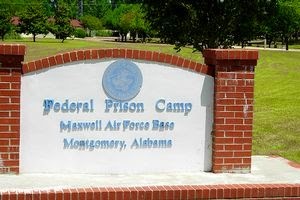 We went through the ordeal, getting the bus that took forever because the prison sits way back on Maxwell Air Force Base. I filled out the form and got to the front. The same guard who drove us there on the bus and clearly saw what I had on, turned me away. My daughter busted out crying. Here is the great thing about this story. I am holding my arms around my daughter trying to console her, we walk out to the parking lot and there is this lady who is in a really nice SUV, saying “do you need a ride back to your car.” I was in a daze a bit and didn’t really quite hear her. (Normally, I don’t get in a car with anyone I don’t know but something said to trust her) Again she said, “I can take you and your daughter to your car.” So I ran up to the SUV and told her what happened. She was a visiting a friend and she works at another air force base so she has access off and on the base and doesn’t have to take the bus. She drove use all the way back to our car. Since we had been out of town, I realized I had jeans in my luggage. I got my jeans and through them over my capri leggings and she drove us all the way back to the prison camp. She said to my daughter ” you are going to see your daddy today don’t you worry.” See the waiting for the bus back and forth could have easily taken another hour or so and we may have run out of time to see her daddy. During our long ride, we talked about white collar crime (her friend is in for that as well) and I told her about your blog and where to go. We shared the same view on it and what families are going through in the after math. I also told her I recently wrote a piece for the blog. I gave her an enormous hug when I got of the car. My daughter said “mommy that vehicle was not around when we got there, where did she come from”. I said she was Angel that God placed there in that moment. I have no doubt in my mind. She was just there in a moment. God is good!! Then when we finally got into see Evan, it was a great visit. I met some other inmates and families who obviously think a lot of him. I always said he will be the most liked guy in prison. He is just that way. During the visit, I look over and low and behold there is Walt Pavlo [the Forbes white-collar crime columnist] who wrote about Evan. I went up to him and formally introduced myself. He was there visiting. What are the chances of these two things happening in one day? I had to share this day with you both. For something that could have been so unpleasant turned out to be a beautiful day. I thanked God for all my blessings and for all the beautiful people I got to meet in one day. There are so many, and all of these families there who all shared the same experience were beautiful and so many loving moments in the room that I observed because we don’t take the moments for granted any more. In a prison camp, I felt a true sense of peace and love. We all belonged together as one family. For the lovely lady who took time to drive a woman and her crying daughter to their car and back to the prison camp, you are an Angel and I am forever grateful for your compassion. God bless you dear Angel and God bless all the families that are going through this same journey. Jeff, I had an unbelievable experience while I was in prison on visitors’ day. My Rabbi was turned away because he did not register that he was coming to see me. He identified himself as clergy but they refused to let him in because of the strict rules of registration. As he was walking away a guard that knew me saw him & asked who he was coming to see. He said my name & the guard said that he remembered him from another visit to me. He called me up to the visitor’s room & allowed us to sit in a private area set aside for an attorney. I was only allowed 15 minutes but it was one of the best 15 minutes I can remember. We sat facing each other as we both recited a few prayers together. These are some of the moments that you keep in your memory so that you can survive. – Barry. Barry S. Diamond is the administrator of reentrysurvivors.com, a web-site dedicated to publishing the success stories of released prisoners.